The four of us stepped inside the dark entryway of Willmore Lodge. Tom and Melody Buersmeyer, from the Westphalia Inn, joined my husband and me for an outing at the Lake of the Ozarks. Immediately, our eyes focused across the room at the wall of windows overlooking the lake. Seated in front of the windows on the floor, several school children listened as a guide told about them the history of Willmore Lodge. We snuck through to the dining room area, admiring the view from more windows, and hastily read brochures that we had grabbed as we passed by the front desk. 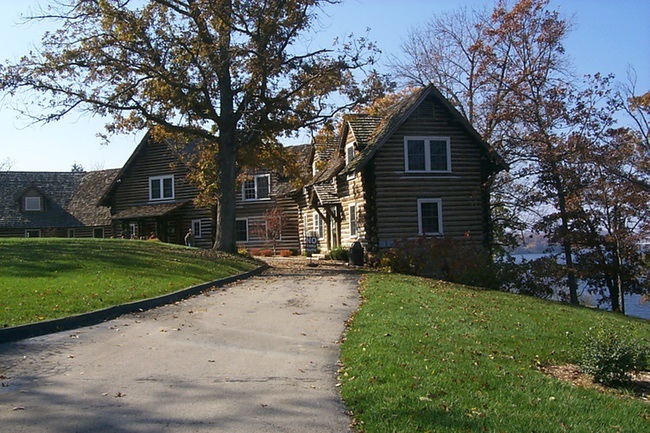 The 6,500 square foot lodge, listed on the National Register of Historic Places, occupies a place of prominence on a hill overlooking the lake. Its history runs rich, symbolizing man’s ability to create something of beauty from nature. It also teaches the tale of danger of letting politics run unchecked. Most people in Missouri know that the Lake of the Ozarks happened as a result of the construction of Bagnell Dam by Union Electric (UE) on the Osage River in the 1930s. For this project, UE employed approximately 10,000 craftsmen and laborers. In fact, the St. Louis firm (Stone and Webster Engineering Corporation) in charge of the Bagnell Dam project also oversaw construction of the lodge. A St. Louis architect named Louis La Beaume designed the 29-room lodge for UE to use as its administrative building during the construction of the dam. Since it was a corporate headquarters for a major business, the plans naturally included several luxuries — such as five bedrooms with separate baths, several patios and a grand fireplace. The building’s construction actually started in Oregon, where Western white pine logs were not only cut, but also completely assembled into an Adirondack-style lodge. Only after inspection and approval by UE president Louis A. Egan, in 1930, were the logs transported by rail to the Ozarks and reassembled. Assembly only required three months. Square wooden pegs and overlapping corner saddle notchings held the logs together. Completing the rustic look, beautiful stones came from nearby quarries for the patios and fireplace. The cost came to $135,000, and the lodge became Egan Lodge. Although UE employed many and produced power so that folks could live near the lake, several townsfolk in the local area became suspicious of the electric company’s ability to sway government issues concerning utilities. UE seemed to want more and more control, taking utilities away from city governments. The Securities and Exchange Commission conducted an investigation that found several wrongdoings by UE, as chronicled in the “St. Louis Post-Dispatch”: “including financial aid to favored candidates for public office, lavish entertainment of legislators and other public officials at the Lake of the Ozarks, and huge payments to numerous lawyers.” I bet you cannot guess where most of the illegal activities took place? By the way, you won’t see anything about the scandal mentioned in the literature available at the lodge. In 1945, UE sold the lodge, and 40,000 acres (including 800 miles of shoreline) to Cyrus Crane Willmore for $320,000, and the site became known as the Willmore Lodge. After changing hands two more times, the lodge finally came under the ownership of UE again in 1996. UE approached the Lake Area Chamber of Commerce with the idea of turning it into a visitors center and museum. The Chamber paid for restoration and UE leases the site to the Chamber for $10 per year. 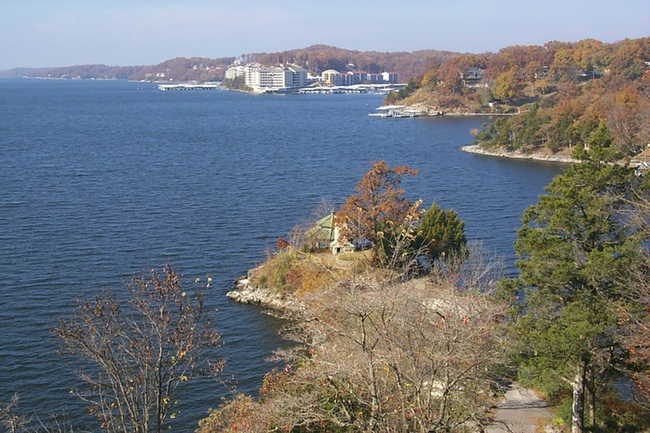 Today, Willmore Lodge serves to tell the story of the development of the Lake of the Ozarks region to all who spend time within the quiet walls of its rooms. Quiet, that is, unless there happen to be 35 fourth-grade students onsite. Enthusiastic children with clipboards — searching exhibits for how many acres of this and that – overran us. Tom regaled several little boys, who were looking at a massive paddlefish in a display case, about the largest paddlefish he ever caught, and how you have to use the method called snagging to get a paddlefish. Their eyes got bigger, and since Tom likes to tell tall tales to tots, you could see that the kids couldn’t decide whether or not to believe old Tom. After he dismissed that group, another group stopped, and we could hear Tom assuming the role of fish-tale teller once again. Fish tales, history, and a big old lodge all added up to make one fine outing for our crew that day. This place would make a wonderful field trip — for kids of all ages. For more information, call 800-451-4117, or check their web site at www.willmorelodge.com.